Directly after the PSA, I took a vacation of sorts last week to go touring around Scotland in search of Guid Scotch Drink with my friend and whisky tour-guide Jason Johnstone-Yellin. What a great time! We started out in Edinburgh at the Scotch Malt Whisky Society Vaults where we could sample from unique single-cask offerings bottled by the SMWS. I'm a member of the SMWSA — and so can order these bottles — but it was great to be able to "try before you buy". Hopefully they'll still have some of 127.5 (Cask #5 of Bruichladdich's Port Charlotte line) for me to order. . . .
After Leith, we headed up north to visit Glenglassaugh and Knockdhu distilleries in the Highlands, passing by dozens of Speyside distilleries. Had really wonderful visits with distillery managers there where we saw the whole production works in action. We also got to visit a certain cask of Glenglassaugh of which I am a shareholder (the 2nd peated octave there). Judging from what we tasted there (even very young stuff), we have reason for being pretty excited about this. I'm expecting a little more than three bottles of a unique cask-strength malt a few years from now. . . .
We swung down from the highlands to catch the ferry from Kennacraig to Port Ellen on Islay — my favorite whisky region. The weather was picking up by this time and they decided to make the ferry foot passengers only. So with some trepidation, we left our car behind and took a surprisingly calm two hour ride to Port Askaig (on the other side of the island) and bused down to Port Ellen. Luckily, the car was waiting for us, keys under the windshield wipers, the next morning. Welcome to Islay! Stayed at Rhona and Hamish Scott's great B&B, Caladh Sona in Port Ellen (Hamish is former distillery manager at Ardbeg, and I understand presided over some fantastic malts — need to remember to pick up my birthday malt one of these days before it disappears!). Really enjoyed meeting two other Oregonians who were staying there: Mick and Tammy, owners of the Highland Stillhouse near Portland. Great folk! I'll be a regular there whenever I'm back in Portland. 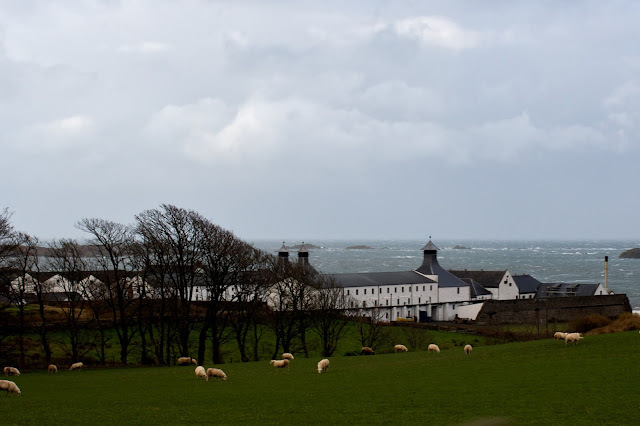 We hit all of the distilleries on Islay except Kilchoman, the newest distillery on Islay which is also producing some really promising spirit which I got to try at the Glasgow Whisky Festival. The UK was enjoying some pretty rough weather, including wind gusts at up to 80mph! Nothing like horizontal rain to drive one inside (even if just into a warehouse!) for a dram. The best visit was definitely with the distillery manager at Bruichladdich, by far the quirkiest distillery on the island. Spent several hours with him. Weather (so it was said) held us up on Islay a short while longer — long enough to enjoy another fabulous breakfast from Rhona! — so we were only able to catch the last two hours or so of the Glasgow Whisky Festival, where we were able to taste a few things that we didn't catch while touring around. All in all, it was just a great trip. I highly recommend you take a tour with Jason. It's well worth the money: he can get you into places that other tour groups (we saw them) can't even get near (and with good cheer)! Now to start saving up for the next one. . . . Here are my favorite 165 photos from the 600 or so I took that week.